Connecticut is home to a variety of snakes that are striking in appearance, such as the Eastern Milk Snake, Northern Ringneck, Worm Snake, Northern Redbelly, and the Smooth Green Snake. For the past two seasons, Brian Kleinman has been capturing images of these remarkable reptiles, working under the supervision of leading herpetologists and with the appropriate state permits. Brian Kleinman holds the Smooth Green Snake he came across during a visit to a grassland area in Rhode Island last week. Photo by Brian Kleinman. "After two summers of searching I finally found a smooth green snake for the DVD!" he wrote in an email, referring to the two videos about Connecticut amphibians and reptiles being produced by Perry Heights Press using scenes he has taped of the animals in the wild. The videos provide remarkable glimpses of the life cycles of local frogs, toads, salamanders, turtles, snakes and lizards and comprise one of the most remarkable portrayals of native wildlife available. 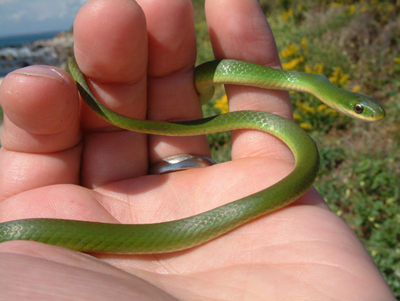 The Smooth Green Snake Opheodrys vernalis has declined in southern New England over the past half century according to Amphibians and Reptiles of Connecticut by Michael Klemens, State Geological and Natural History Survey, 1993. It "favors open, unforested habitats including meadows, pastures, fens, coastal grasslands [and] mountaintop 'balds.'" Today, they are most common in our region in southeastern Connecticut, into Rhode Island. The decline in green snakes mirrors a decline in grasslands in general in Connecticut over the past century, as "agricultural lands was abandoned and reverted to deciduous forest," says Klemens. Many wildlife species, from plants to invertebrates to reptiles and birds, that were characteristic of native grassland communities have come under increasing pressure as habitat has been lost. Like the Green Snake, their "survival is closely tied to land management practices which maintain fields and meadows," says Klemens. "Open fields and meadows in state parks, forests, and game management areas that contain smooth green snakes should be maintained..."
By protecting grassland habitats populations of these remarkably beautiful snakes will be protected, along with entire communities of wild things adapted to surviving in Connecticut's open field ecosystems. my son found 12 babies last night under a tarp by the garage. we live on the coast in Maine. They are about 8 - 10 inches long and very tiny. He brought one inside last as he thought they would die from the cold. Is it possible to keep it alive during the winter inside?